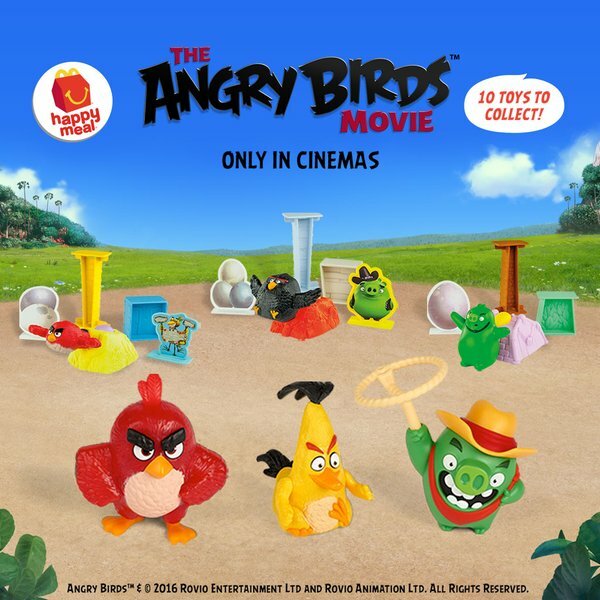 Collect The Angry Birds Movie Happy Meal! Launch the fun with The Angry Birds Movie Happy Meal! Collect all 10 toys! Flightless birds lead a mostly happy existence, except for Red (Jason Sudeikis), who just can't get past the daily annoyances of life. His temperament leads him to anger management class, where he meets fellow misfits Chuck (Josh Gad) and Bomb. Red becomes even more agitated when his feathered brethren welcome green pigs to their island paradise. As the swine begin to get under his skin, Red joins forces with Chuck and Bomb to investigate the real reason behind their mysterious arrival.